Biotinylated Goat anti Rat IgG antibody (STAR131B) used to detect bound Rat anti Murine F4/80 antibody, clone A3-1 (MCA497GA) on formalin fixed, paraffin embedded tissue sections by immunohistochemistry. Tubulointerstitial inflammation and loss of peritubular capillaries in CKD kidneys. Kidney sections of control and CKD mice were stained for macrophages (A), neutrophils (B), and vascular endothelium (C). 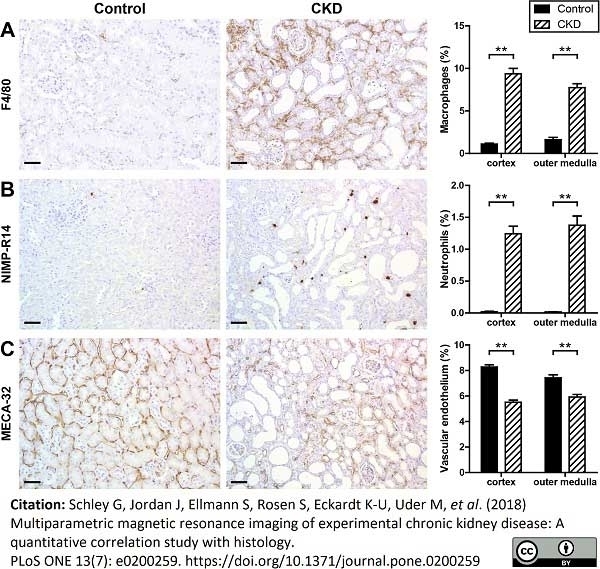 Shown are representative immunohistochemical stainings of control and CKD kidneys and quantitative analyses of each staining categorized for renal cortex and outer medulla. Black bars represent control (n = 15) and dashed bars CKD kidneys (n = 16). Scale bars, 50μm. ** p<0.01. Goat anti Rat IgG antibody recognizes rat IgG. This antibody has been cross absorbed against pooled mouse sera and pooled mouse plasmacytoma/hybridoma proteins. Monticone, S. et al. (2015) Immunohistochemical, genetic and clinical characterization of sporadic aldosterone-producing adenomas. Mol Cell Endocrinol. pii: S0303-7207(15)00223-3. Schley, G. et al. (2018) Multiparametric magnetic resonance imaging of experimental chronic kidney disease: A quantitative correlation study with histology. PLoS One. 13 (7): e0200259.